Are you looking for a unique, rustic atmosphere for your next event? Whether you are looking to host your wedding reception or rehearsal, a business social, milestone celebration, fund-raiser or holiday party, our venue is perfect for your event! Nestled upstairs sits the warm and inviting atmosphere of our Whiskey Room. Filled with history and tradition, this beautiful space can accommodate up to 50 people reception style. When combined with our adjoining dining room, the Music Room, we can hold larger events for up to 200 people. This Music Room has large comfortable banquette seating, a fireplace, hardwood floors and audio/visual options to set the scene for a memorable event. The upstairs level also consists of a Rooftop Patio, dramatic in its setting amongst Charlotte’s tallest skyscrapers. This is the perfect atmosphere for any event from wedding rehearsal or receptions, corporate events, happy hours, birthday parties, reunions. Book your event today! Our beautifully upgraded rooftop patio has boasts unique views of the Uptown Charlotte skyline. A relaxed atmosphere, perfect for any occasion. It can seat up to 60 guests and host up to 100 reception style. This Music Room has large comfortable banquette seating, a fireplace, hardwood floors and audio/visual options to set the scene for a memorable event. It can seat up to 75 and host up to 150 reception style. It includes a stage and a DJ Booth - ask about our recommended entertainment options. When combined with the adjoining Whiskey Room & Rooftop Patio it can seat up to 160 and host up to 250 reception style. The Whiskey Room is an ideal space for small intimate gatherings. 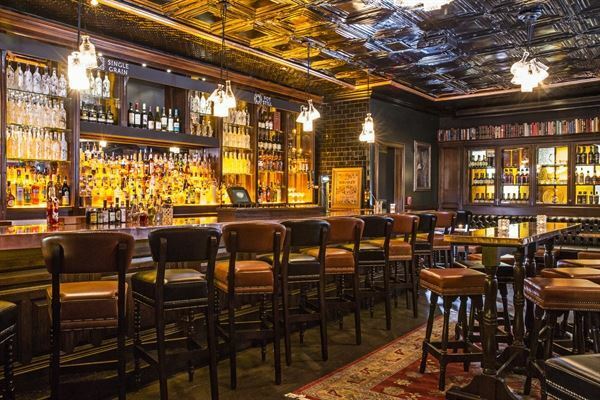 It’s cozy, warm furnishings complimented by the copper finishes, open fireplace and beautifully crafted bar will ensure your guests experience a true Irish welcome. It can seat up to 35 and host up to 50 reception style. When combined with the adjoining Music Room & Rooftop Patio it can seat up to 160 and host up to 250 reception style. Emmet, the GM was awesome to work with and I really recommend this venue for any party. Besides it being a great atmosphere, everyone was so friendly and flexible.